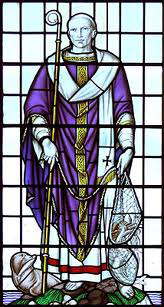 St. Wilfrid was an English bishop. Born to a noble family in Northumberland in the year 634, he was educated at Lindesfarne and then spent some time in Lyons and Rome. Returning to England, he was elected abbot of Ripon in 658 and introduced the Roman rules and practices in opposition to the Celtic ways of northern England. In 664, he was the architect of the definitive victory of the Roman party at the Conference of Whitby. He was appointed Bishop of York and after some difficulty finally took possession of his See in 669. He laboured zealously and founded many monasteries of the Benedictine Order, but he was obliged to appeal to Rome in order to prevent the subdivision of his diocese by St. Theodore, Archbishop of Canterbury. While waiting for the case to be decided, he was forced to go into exile, and worked hard and long to evangelize the heathen south Saxons until his recall in 686. In 691, he had to retire again to the Midlands until Rome once again vindicated him. In 703, he resigned his post and retired to his monastery at Ripon where he spent his remaining time in prayer and penitential practices, until his death in 709. St. Wilfrid was an outstanding figure of his day, extremely capable and possessed of unbounded courage, remaining firm in his convictions despite running afoul of civil and ecclesiastical authorities. He helped bring the discipline of the English Church into line with that of Rome. He was also a dedicated pastor and a zealous and skilled missionary. The brief time he spent in Friesland in 678-679 was the starting point for the great English mission to the Germanic peoples of continental Europe. His feast day is October 12th.